Here’s a blurb: This is my favorite “table project” in the countdown, and along with On a Journey, was the debut of Greater Vision. 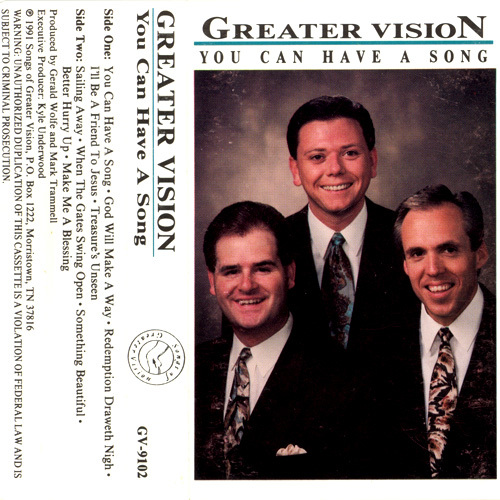 Gerald Wolfe, Mark Trammell, and Chris Allman had, in my opinion, the greatest trio blend in the history of southern gospel. That was already evident on this early project. There are only two songs that really stand out for me, but they stand out in a big way, and there aren’t any really weak songs. I just wish I was more patient a while back and didn’t buy that cassette copy on e-Bay, only to have Greater Vision re-release it on CD soon after. Hello, I have read this a couple of times, and I have been trying to find this album. I know it’s no longer being released. Probably for a long time now it hasn’t been. I don’t know if you know where I could possibly get it. I am collecting all of their CDs. I wish I could find it somewhere. Thanks for your time.